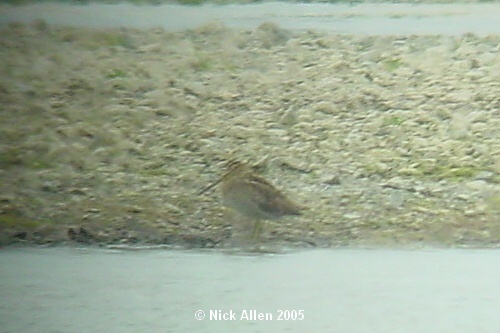 Nick Allen discovered a snipe at the Waipara Rivermouth on the morning of the 27 February 2005. As seems to be typical of snipe that are found in New Zealand, this bird was showing well on the open gravel beside a creek. Nick obtained the digi-scoped photos shown below on the day. Thanks to Nick for making the photos available. The last New Zealand record of Latham’s snipe (which this bird is currently assumed to be – a Rare Bird Report is going to be submitted) was at the Manawatu Estuary in 1999. The Manawatu bird also showed very well, being seen on several occasions roosting with the wader flock on the exposed sand spit. Maybe we just don’t find the ones that are more secretive?! 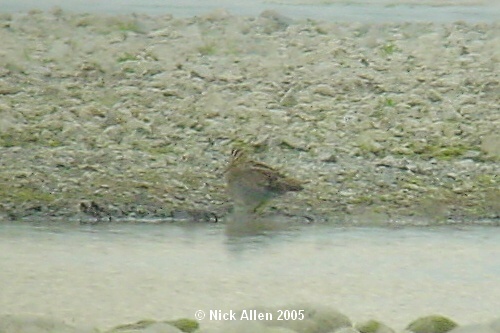 This latest bird was again seen by Rob Lawrence and Alan Shaw on 3 April 2005 at the same site. It was viewed by scope for 30 minutes, and Alan managed to get some video footage of the it.